The pungent raw-milk Munster that frequently ends a meal in Alsace is surely one of France's finest cheeses. 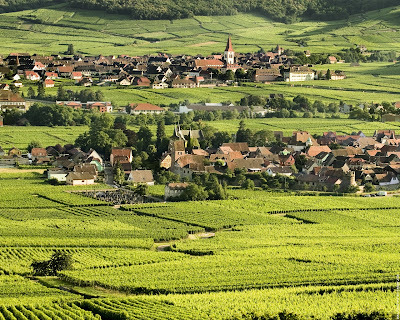 Many creameries make Munster, but only one makes Grès des Vosges. It is a proprietary cheese commissioned by Fromi, a large European broker that makes the cheese in multiple sizes but only two are available here. France can only send us versions made with pasteurized milk because of Food and Drug Administration regulations. 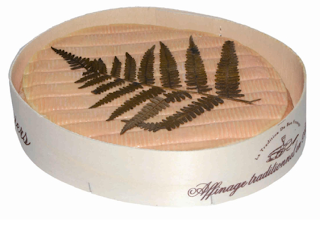 Grès des Vosges (gray day vozh), is a similar cheese made by an Alsatian creamery that also produces Munster. Both wheels are washed-rind cheeses made with cow's milk and matured for about a month, but the lesser-known cheese delivers more pleasure. Both are relatively flat, less than two inches tall, with a moist, tacky, sandstone-colored surface and a fern leaf on top. Bring this cheese to your nose before you taste it. Its yeasty aroma will seduce anyone who appreciates stinky cheese, although it is not nearly as robust as some. Notes of garlic, mushroom, barnyard and cultured milk, all fuse into a compelling scent. Just underneath its thin, crunchy rind, the cheese is creamy and the color of pale butter, becoming firmer and paler toward the heart. The texture is semisoft and supple. Consider a spicy, racy white wine from Alsace, such as Gewürztraminer or Pinot Gris.